Meet my Valentine. 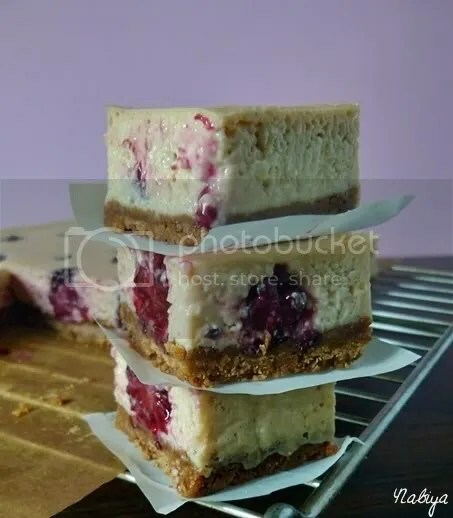 This is Berry Cheesecake Bar, and unlike the usual horrors that come with my past Valentine’s day overly-expensive dinners and bouquets, this little baby was fuss free, had no expectations of me, and was a damn good time. Forever Alone, level 12. LOL. This was the first time I attempted a cheesecake, and a biscuit base that didn’t crumble into pieces when I touched it. The feeling I got when I woke up this morning was something akin to the feeling I usually get on Christmas morning, though more intense. I rushed through my getting-ready-for-work process (dumped necessary make up in my handbag so I could apply en route) so I could run downstairs and snap some pics while the light was working with me. By the way, I’ve decided 9am sunlight is the best for food photography. Pulling the cheesecake out of the pan was the most daunting experience, waiting to see if it had set nicely, and if it would even work! But when it just slid out, and I laid it down on the table, I think I might have fallen in love a little bit. What a beautiful, beautiful cake, and I’m so incredibly relieved that it was a success! Who knew cheesecake could be so easy? I cut up half of the cake and brought it into work today. It’s already gone, and seems to have gotten good reviews… though I’m not sure if people are just being nice. I don’t mind though, I’m a fan of these bars! Crumble crackers in a food processor if you have one, mine broke, so I just put the biscuits in a ziploc bag and whacked the biscuits with a rolling pin. Anger management, I have it.